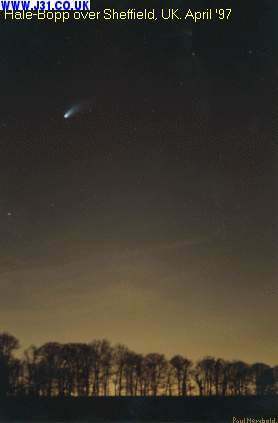 Comet Hale-Bopp in April 1997, looking north(ish). The glow at the bottom of the shot is from Kiveton/Dinnington and places north etc. The low cloud reflected the 1,000s of yellow sodium streetlights that silloetted the trees of Bull Wood.